The characters and world in the Finishing School books are so delightful and I enjoyed the first three books in this inventive series immensely. This book has some redeeming features... some truly wonderful moments, encounters, character developments, including for some secondary characters who finally have their day here, and a good day too. Hard to describe without spoilers. But where the first three books felt fresh and imaginative, these felt a bit... can I say teleological here? 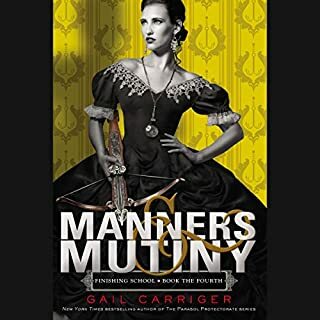 Like Carriger was struggling to wrap up this story in a way that would put everyone where they needed to be at the beginning of the Parasol Protectorate books. I also feel like the romance was a little incoherent (in this book and the previous one) with some inconsistent character development of the male leads, so that fell a little flat for me. It all felt a little forced. So the book is good but just not as good as the other books in the series. Don't get me wrong. I'm still going to listen to the whole series again and would encourage anyone to buy it. This just wasn't my favorite of the four books. Jessica Tregarth goes to England to visit her grandfather - an invitation that surprises and pleases her. The only link she has with her dead father's family is an antique ring he brought with him to America. This will be a chance to learn more about who she is; it will be fun. She's barely off the boat before the chase begins and Jess finds herself playing a deadly game of cat-and-mouse through Cornwall, helped by David Randall, the ingenious author of a series of paperback gothic novels. This book provides interesting backstory for an important character in the Vicky Bliss mysteries. Those are probably my favorite Elizabeth Peters books, especially Street of the Five Moons, Trojan Gold, and Night Train to Memphis. But this book is just a little less polished. It's hard to get attached to the characters or to sympathize with their plight because it all seems a bit unrealistic. Still, a worthwhile listen--entertaining and fun. Well-read in this audio version. Just not as great as I'd hoped. 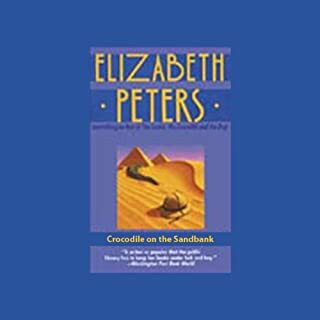 This is the first novel to feature Ms. Peters's Egyptological heroine, Amelia Peabody. It is truly delightful. Although it introduces a recurring character, this book is a treat on it's own--you don't have to commit to the whole series in order to enjoy it (although after you enjoy it, you will be unable to resist the next one.... and the next....). If you like mystery, romance, adventure, and/or humor, you cannot do better than this book. Nor can I imagine a better narrator for the book than Susan O'Malley. The pacing is excellent, the reading is clear, the characters' voices are distinct without being annoying, and the humor of the writing comes through perfectly. Elizabeth Peters is a fine writer whose books are smart, funny, well-structured, and beautifully written. Her best books (like those of Georgette Heyer, Mary Stewart, Dorothy Sayers, and a handful of others) follow in the steps of P.G. Wodehouse and Jane Austen, proving that reading can be light and enjoyable without sacrificing quality or even delicate social satire. And this book is indisputably one of her best. So, a thousand a month, all expenses, the opportunity to spend some time on an Arizona ranch...it was everything a young graduate student trying to prove herself might want. And it was...until Hank suffered an accident, then disappeared. 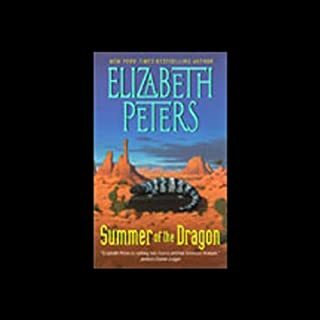 Summer of the Dragon is a terrific early Elizabeth Peters mystery/romance. It doesn't feature any of her popular recurring characters, but stands on its own very nicely. It is funny from beginning to end. The heroine is very likeable. Like so many Peters stories, this one does a great job of dealing with interesting and believable archaeological/anthropological topics in a very accessible way. The quick-moving and enjoyable dialogue combined with the heroine's down-to-earth voice make everything easy to follow and very fun. Also, this reader does a wonderful job (but for mixing up a word or two in a briefly confusing but not really disruptive way); I thought she really captured the characters without overdoing it. Be prepared that some elements of the story are a bit dated (for example, our heroine gets some flack for being a "feminist," apparently because she is pursuing a Ph.D. and a job) but after all the book was written in 1979. A witty, intelligent, and delectable mystery from Georgette Heyer. This British "cozy" mystery has eccentric characters, sparkling dialogue, and an intricate plot that is just plain fun. Take one rambling country house whose owner is found dead, supposedly poisoned. Add one ill-assorted family circle of very odd people, all with excellent motives for murder. Wow! 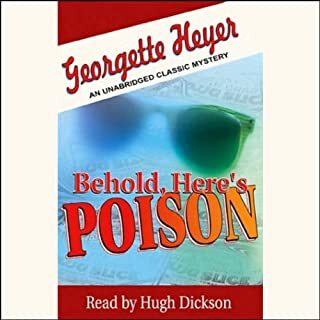 Audible has Georgette Heyer! Behold, here's a great mystery story! I just love Georgette Heyer and am frustrated that more of her books aren't available to download on Audible. But this one was an excellent choice for inclusion in the selection! If only they'd add Death in the Stocks. This is a very witty mystery story with the same type of well-written dialogue and nuanced, lightly satirical, almost Austenian character development that characterizes Heyer's best work. This is such a wonderful story. I read The Secret Garden over and over as a girl, and still never tire of it. (The same is true of The Little Princess.) I love how real the two children at the heart of the story are, and how their growth as characters is so dramatic but also generally very believable. 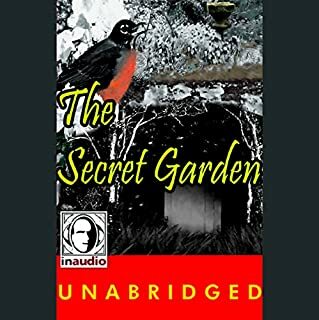 Audible has several editions of the Secret Garden, so I listened to samples of all the readers and ended up choosing this one. I'm glad -- the narrator does a very nice job of conveying the spirit of the characters without letting her own interpretation get in the way of the story as written. My only complaint is the same as the previous reviewer's; the editing of this audiobook left no space whatsoever between the end of one chapter and the beginning of the next, and so each time a new chapter begins, it is quite jarring.